Last we heard about Jim Sheridan's Dream House, the production was in some trouble. The the film had completed production, some re-shoots were needed, but the star, Daniel Craig, was in Sweden filming David Fincher's The Girl With The Dragon Tattoo. This was all the way back in September, however, so the whole thing may be resolved by now. Regardless, it would appear that the film's promotion continues. 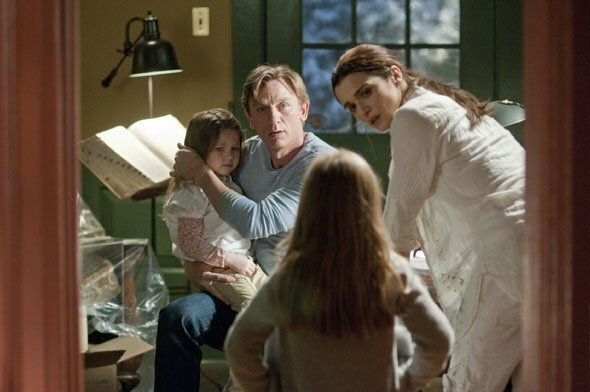 Universal has released the first image from the thriller, which sees Craig and Rachel Weisz move their family into a house with a history of murder. Co-starring Naomi Watts, the film is scheduled to be released on September 30.